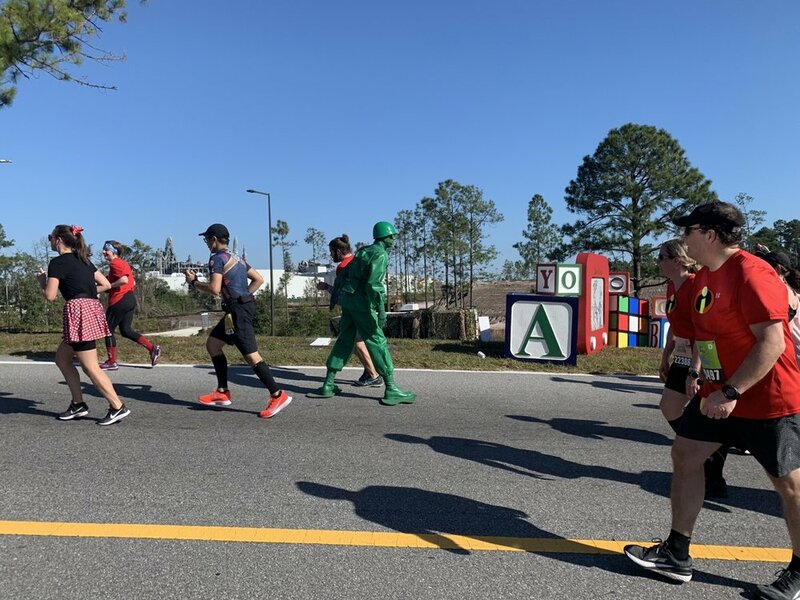 In this post, we recap the 2019 RunDisney Walt Disney World Marathon race and provide some information on the 2020 race, scheduled to be held on Sunday, January 12, 2020. We registered for the 2019 Walt Disney World Marathon as part of the Dopey Challenge. The Dopey Challenge consists of all four Walt Disney World Marathon Weekend races—the 5K (Thursday), 10K (Friday), Half Marathon (Saturday), and Full Marathon (Sunday). To register for the Dopey Challenge, you just register for a single event (“Dopey Challenge”), you do not register for all four races separately. We’ll have a full Dopey Challenge post up in a week or so. The 2019 race was held on Sunday, January 13, 2019. Registration is done online at the RunDisney website. RunDisney used to use a third-party provider for registration services, bus has since switched to its own (better) system. You’ll now register using your Disney account. Registration for the Marathon is a straightforward process, so I’m not going to walk you through the specific process. Here are some relevant details. 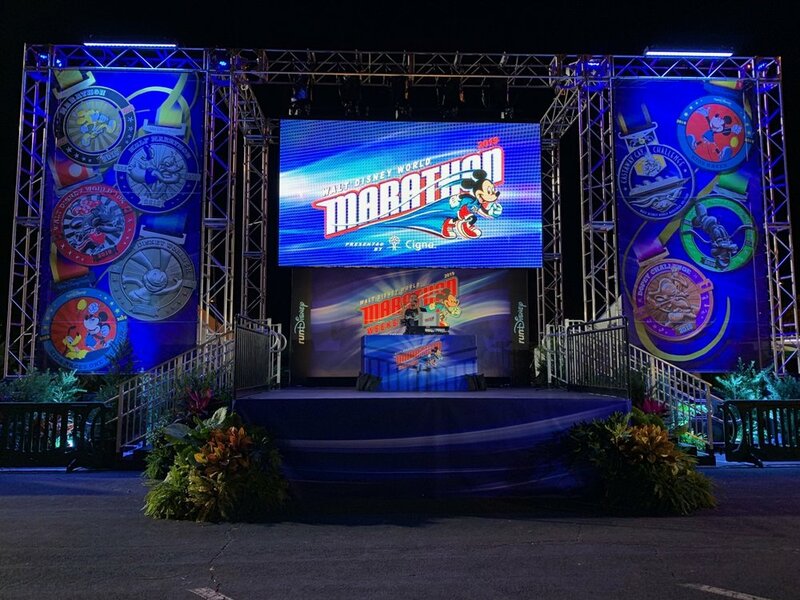 Registration for all the Marathon Weekend races was originally set to open in April 2018, but was delayed as RunDisney changed registration systems. Registration opened to the general public on July 19, 2018. As Walt Disney World Annual Passholders, we had access to early registration on July 17, 2018. Unlike the 5K and 10K, the Half Marathon and full Marathon did not sell out in 2019. 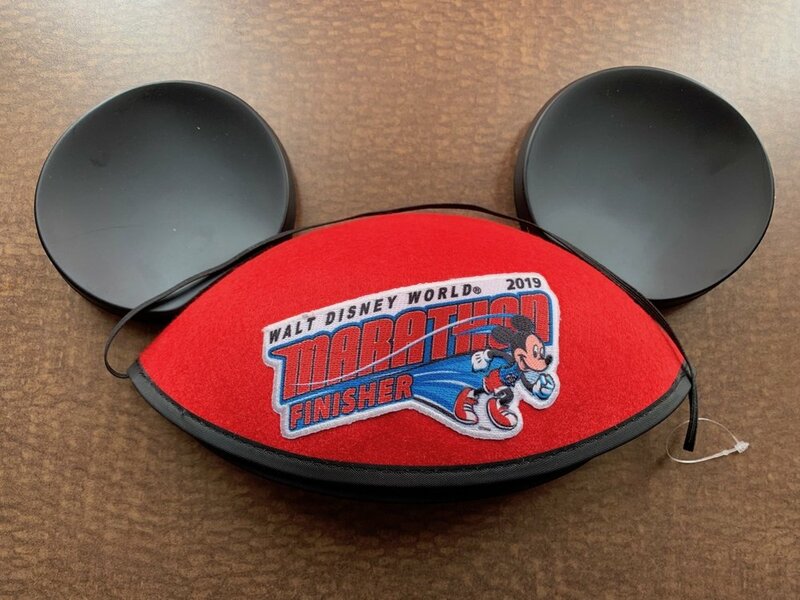 The 2020 Walt Disney World Marathon is scheduled for Sunday, January 12, 2020. As always, it will be the final race of the four-race / four-day Walt Disney World Marathon Weekend. If you’re interested in running the 2020 Walt Disney World Marathon, you should join the official RunDisney email list and be sure to visit their website a few times between now and April to make sure nothing changes with registration. Although the marathon did not sell out this year, you should always be prepared for the possibility. We recommend you be prepared to register as soon as registration opens (usually between 10AM and Noon Eastern). If you don’t have a Disney account already, you should set one up today by visiting DisneyWorld.com. Even if the race sells out, you may still be able to run by raising money for charity. While we’ve done this for several other races, we haven’t done it for any RunDisney events. Here’s an example charity registration page for the 2019 races. For that organization, the Marathon fundraising requirement was $900. Third, if you’re running Dopey, do your “complicated” costumes first. If it has bells and whistles, or if it requires an unorthodox piece of gear, wear it for the 5K or 10K. We’ll have more merchandise photos in our full Dopey Challenge recap. For now, we’re mostly focused on practical information for Marathon runners and Dopey Challenge runners. These buses run roughly every 30 minutes and stop near (but usually not at) where the regular Disney buses stop at hotels. Each bus route has a color and/or number. When you return to your hotel, you’ll get on at the bus stop with your route number (it’s really easy and there are tons of volunteers to help you). The Expo is held on Wednesday through Saturday of race weekend. This year, the Wednesday hours were 10AM to 8PM. Dopey runners need to pick up their bibs at the expo on Wednesday for the Thursday 5K. Marathon runners can pick up their bibs Wednesday, Thursday (10AM to 7PM), Friday (9:30AM to 7PM), or Saturday (9:30AM to 3:30PM). Marathon runners got their bib here and then proceeded to get their race shirt in the main expo building. Your shirt will be in your gear check bag. Check your shirt to confirm the size is correct, it fits well, and it is in good condition. The race was scheduled for a 5:30AM start—the same time as the shorter races. Buses from the hotels began departing at 3:00AM—thirty minutes earlier than the 10K and 5K races, same time as the Half Marathon—and Disney recommends you be on a bus by 3:30AM—also thirty minutes earlier than the shorter races and same time as the Half Marathon. We planned to basically mirror our transit times from the previous day, as the starting procedures for the half and full marathons are identical. I woke up at about 3:45AM. I always get my race outfit ready the night before, particularly for these early RunDisney races. For every race, I pin my bib on my shirt (or wherever I’m pinning it) the night before so I don’t have to deal with that. You have to take the marathon seriously, and that means running in gear you know will get you through 26.2. I went with the Dopey Challenge shirt and a light jacket I knew I could run with around my waste. I had actually considered a short sleeve tshirt the night before, but I (regrettably) forgot this plan. We left our room at All-Star Sports at about 4AM and were on the bus at 4:04AM. We arrived at 4:22AM before making the 5-minute walk from the drop off to the staging area. The biggest activity before (and after) the race is the opportunity to meet some characters. For the marathon, the lineup is usually Mickey, Minnie, Goofy, and Dopey. There are four separate lines. The corrals for the longer races open earlier—about an hour before start. Only runners with bibs are allowed into the corral area. Unlike the 5K and the 10K, the corrals for the Half Marathon and Full Marathon are about a 20-minute walk from the staging area. The announcers move over to the starting line stage when the corrals open, so you’ll get to enjoy them until you depart. I was put in Corral A (which means that Corral has become much slower over the years, because I sure have), and Emily was in Corral C. In the ten marathons and numerous other races I’ve run, I’ve never been in one where you couldn’t move back to run with someone. So I dropped back to Corral C to run with Emily. The race starts in “mini-waves” released every two to three minutes. Every mini-wave gets fireworks. These waves are smaller than the corrals, so even if you’re in Corral A, you probably won’t start right at 5:30AM. The course map changes a bit every few years, but has a few consistent elements. The first 6.5 miles is identical to the first 6.5 of the Half Marathon. You run north on World Drive, through the Magic Kingdom gate, and into Transportation and Ticket Center. Then you enter Magic Kingdom through the front and run up Main Street U.S.A. and through Tomorrowland, Fantasyland, Liberty Square, and Frontierland—including going through Cinderella Castle between Fantasyland and Liberty Square. Then you begin the first treacherous part of the day—the highways from Magic Kingdom to Animal Kingdom. There are some cool highlights along here, don’t get me wrong, but it’s just really rough coming out of Magic Kingdom and then having to be on highways for 6 miles. We’ve each run ten marathons and agree that around mile 8 is where you first get a sense of how your day will go. Luckily, we were treating this is mostly a “fun” run, and our only goal for the first half was to make it to Animal Kingdom because…well…just read on. Some highlights between Magic Kingdom and Animal Kingdom include Nautilus and real animals from Animal Kingdom. The lowlight—the lack of food before mile marker 12. This seemed to be a real oversight. On the one hand, runners are responsible for fueling themselves and water and Powerade are sufficient to make sure no one dies. On the other, this is a big race for first-timers and inexperienced runners, there were energy beans halfway through the Half Marathon, and Disney recommends people leave their hotels by 3:30AM! Calories every five miles would be appropriate. At mile 12, there were bananas, so I scarfed down two of those. You finally arrive at Animal Kingdom right around halfway. Typically you enter near Harambe and then run over into Asia and out through Dinoland U.S.A. The only notable downside to the route is the sun is poorly positioned for good Tree of Life photos (hence why I don’t have any). But the best part—Thirsty River Bar is open! We had been looking forward to Thirsty River the entire first half of the race, and were glad to see it open as expected. Drinking at Animal Kingdom is a favorite pastime of ours, especially during the Walt Disney World Marathon. I made a big mistake of getting a Spiced Excursion Ale. I love Spiced Excursion, but it is a potent taste for the middle of a marathon. Exiting Animal Kingdom you’ll encounter some great cheering from spectators and people heading to the park. This is also usually the first group of fans who are themselves offering food. If you’re a hygienic person, you maybe don’t take food from strangers or stick your hand into a bag of pretzels with everyone else. If you’re us, you grab as much food as you can eat or carry. I don’t want to divert too much into general marathon and running discussion, but this is just an important thing to cover here because so many first-timers are probably reading this. “Hitting the wall” occurs when your body burns through its glycogen stores (made from carbs) and switches to burning fat or protein. My personal experience with the wall consists of two symptoms. The first is general, harsh fatigue. This is the kind of fatigue that slows you down to paces you didn’t think possible. It’s a “WTF is happening to me?” fatigue where you can shuffle your feet for 100 yards before you stop and walk again. The second is a biological symptom—production of ammonia. If your body doesn’t switch to burning fat when you run out of glycogen, it will switch to burning protein, which produces ammonia and a harsh ammonia smell. Obviously if your body burns fat first, you won’t encounter this smell, but you might still hit the wall if your body hasn’t adapted to efficiently burning fat. At the Walt Disney World Marathon, this is also where the heat starts to be a real problem. The temperature climbs over 65, then 70, and the sun beats down on you. This isn’t just unpleasant—it’s dangerous. Unless you have extensive training in these temperatures, you need to listen to your body and pull back if you’re not feeling right. Most importantly—don’t make a mistake of thinking symptoms from the heat are “just” you hitting the wall. You’re not meant to PR or “push through it” at those temperatures 20 miles into a race. If you start feeling unwell, either stop at a medical station or ask someone who is walking if you can walk with them for a bit. Or run with a partner, which we usually do. Because of the wall and the heat, there’s a particular part of the race that the RunDisney community loves to hate on—the 3.3 miles through ESPN Wide World of Sports. I don’t find anything about this part of the course particularly offensive, but I’ve read multiple reviews where people hate on it. I think this is mostly because it’s where people hit the wall. There are also a lot of turns involved, which isn’t great this late in a race. As we entered ESPN Wide World of Sports, we heard (from a course DJ) “You’re at mile 17.5—if you’re exiting you’re at 20.8,” as if to remind us of the full 3.3 miles of awfulness ahead. Okay but seriously. ESPN Wide World of Sports usually has two character spots, great fans offering food in the parking lot, and it mostly marks the end of boring highway running. It’s the beginning of the end. Exiting ESPNWWS, we spotted the Balloon Ladies and sweep buses. If you’re at the back don’t keep the 16-minute pace, you’ll be caught by the Balloon Ladies and stuck on a sweep bus. Exiting Wide World of Sports, you’ll run opposite the entering runners and then up the highway ramp toward Hollywood Studios. This is where you get one of the real highlights of the race—the Green Army Man. He gives everyone some motivational yelling, and is always clever with the jokes about people’s costumes (“Come on Captain America! Give us something to ‘marvel’ at!”). From there, you enter Hollywood Studios through the back by Tower of Terror, passing through the celebrated “Chocolate Checkpoint” where volunteers hand out a variety of chocolate items. Now you’ve got people cheering you on almost the entire remaining 3 miles—along with a few grumpy looks from guests who didn’t know about the race. Exiting Hollywood Studios, you run over to Epcot. This year, we were on the Boardwalk side of Crescent Lake. In the past, we’ve run on the Yacht/Beach side. From there, you enter Epcot, take a final lap around World Showcase with music blaring, fans cheering, and beer for sale, before finishing through the same finisher line used by all the other races, past Spaceship Earth through the northeast corner of the park. The Half Marathon and Full Marathon also have a few other features the shorter races don’t. You’ll see choir groups, high school bands, and DJs scattered throughout the course. The Half and Full (and the shorter races, but it matters less) also range from having an incredibly wide course to incredibly narrow. We’re talking four lanes of traffic across as some points and four people across at others. The particularly narrow sections are right before and right after Magic Kingdom, around and through ESPN Wide World of Sports, and everything after you arrive at Hollywood Studios. There’s some wiggle room—but we’re talking yards, not miles. If you get caught by the Balloon Ladies, you’ll be stuck on a bus at the next sweep point and driven back to the staging area. Photopass is also present in front of Cinderella Castle. They have multiple photographers there, so this is actually one of the quickest photo spots you’ll encounter. Note: I didn’t think to pay attention in Epcot. Those stops are technically open to all guests of Epcot, but Cast Members prioritize runners. Most notably, we saw Belle in France and Snow White in her normal spot in Germany. Lines are typically around 5 minutes, though anything from 0 to 10 occurs. The character stops are (almost all, see note on Photopass above) staffed by Photopass, and they’re happy to take a photo on your device as well (be prepared with it). Mind the fact that your lens might get sweaty and need a wipe to avoid lens flare (plenty of my pictures have it). Walt Disney World Marathon Finisher ears!! There are photographers setup to take finisher photos. Gear pickup is right after the finish line. From there, you’re back at the staging area. This is a good time to grab some character photos (the four from before the race are back). If you’re running the Goofy or Dopey Challenge and gear checked your other medals, you can even get a picture with all your medals! If not, you’ll still have a few medals to show off. At Disney World, we always try to stay loose after marathons by visiting the parks. At pretty much all our other marathons, we go home and eat a ton of food. Honestly, I don’t know which is better. This year, I was a zombie walking through the parks, but it was worth it to stay loose until I got home and fell asleep on my couch. It’s tough to pass fair judgment on the Walt Disney World Marathon. This is a unique race. You run through four Disney theme parks and get tons of great character encounters along the way. These are features you won’t get in any other race. But it’s also missing the continuous crowds and energy of races like Chicago, Berlin, and Tokyo. If you’re a big city runner, you’ll no doubt be bored much of this race. If you’re a fan of nature, spending four to seven hours on highways might not appeal to you. Besides the fact that I think they need food earlier on the course, this is a very well managed race, from expo to finish. Limited by what is sometimes a boring course, RunDisney does everything it can to build a fantastic race experience, and you’ll probably see us back out there in 2020!